I do like it when you get asked to use particular ingredient to try for free 😊😊 And so when I was contacted by Food Thoughts to try out a sample of their Finest Organic Fairtrade Cocoa, I jumped at the chance. Mostly to try a product I had not seen or tried before. Pre heat the oven to Gas 3/160c and line a 2lb/900g Loaf Tin. Firstly sift the cocoa, gluten free flour and ground almonds together until well combined. Then beat until soft and creamy, the butter and caster sugar. Then pour in the egg mix slowly and beat until well mixed. Then pour in the rest of the ingredients and beat well. Remember the glacé cherries need to be chopped otherwise they’ll sink! The mix needs to fall off a spoon when lifted, so you may then extra milk to do this. Beat in well if required, but with care, as it will splatter 😉. Pour into the prepared loaf tin and bake on the middle shelf for 50 – 60 minutes. Use a skewer to check it’s cooked. If it comes out clean, it’s done. Leave to cool before removing from the tin. And decorate accordingly if you want to. I decorated mine with some left over white chocolate ganache I had, but you could easily just melt some white chocolate for the same effect. Would I buy Food Thoughts again? Yes, but it seems it’s currently only available in a few Sainsburys. So after last night’s excitement with the new series of ‘The Great British Bake Off’, I though I’d post something a little different. This has gone down a gluten free treat! Baked and gone in day, an instant hit that took me by pleasant surprise. A ‘cakie’ is a cross between a cookie and a cake. The result is a soft, slightly chewy, yet moist, cake texture. It is incredibly moreish. I have seen cakies as individual cakes, but for this I baked it as a traybake. 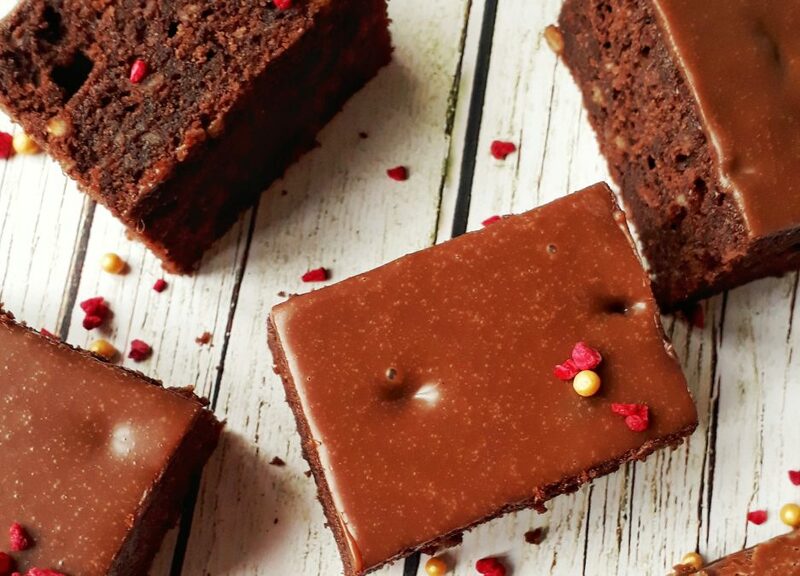 Because quite frankly, you just need a bigger piece of cake! Having tried to do this a couple of ways, this has been by far the easiest. It isn’t though complicated. 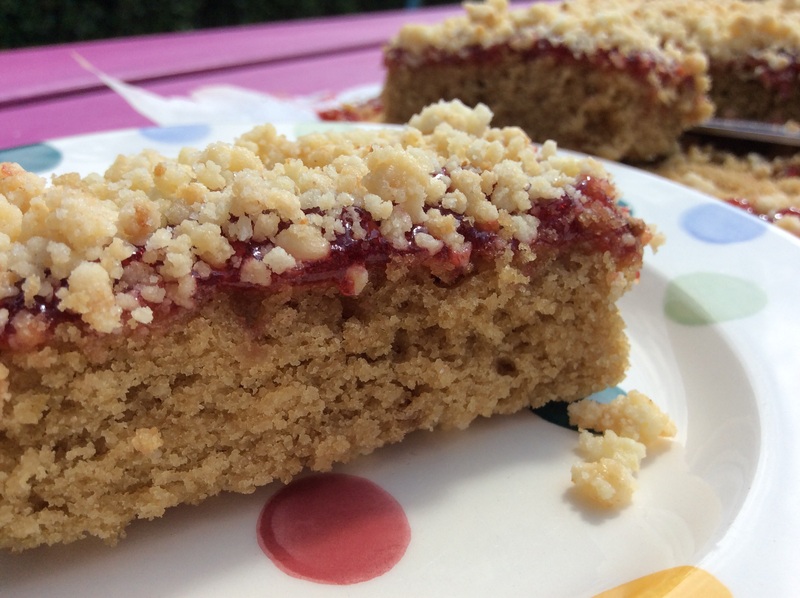 Firstly you make a small batch of Gluten Free crumble and bake this. 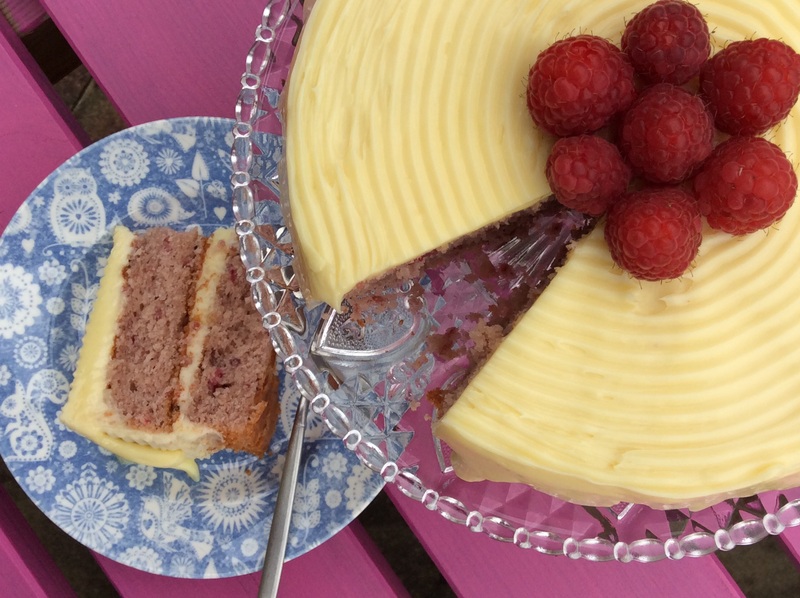 Then you make the base – the lovely soft and moist Gluten Free Cakie. 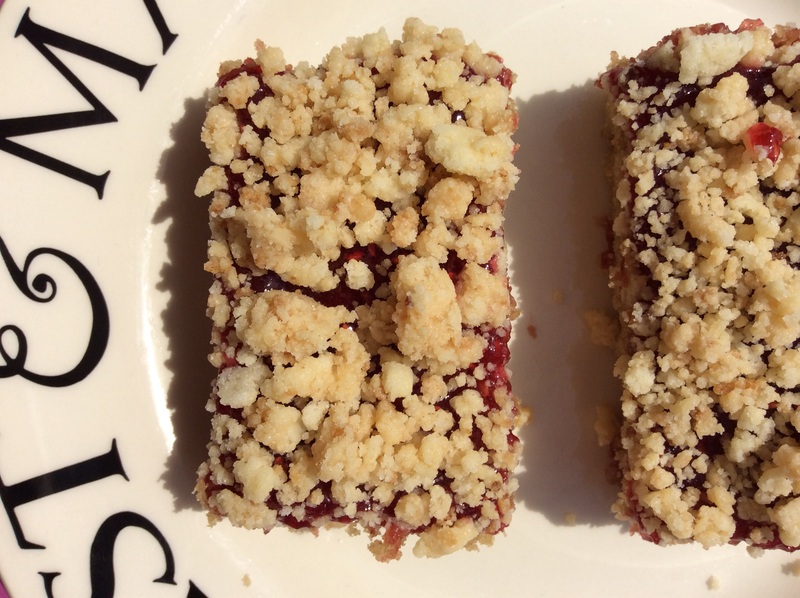 Then, when this cooked and cooled, spread with warm jam (it’s easier to spread warm) and sprinkle over with the crumble. Cut and enjoy. Rub the gluten free flour with the butter to form small breadcrumbs – you could do this in a food mixer for a slightly refined result. Then mix in the sugar. Pour the gluten free crumble mix onto the lined baking sheet and bake for about 8 minutes, until slightly golden. Once out of the oven, leave to cool. it will ‘harden’ as it cools. Then once this is cold you can then crumble some more with your fingers. Beat the butter and the sugars together until soft and creamy. Beat in the eggs and the vanilla extract. Then fold in the dry mix and mix well. Spoon into the lined tin and bake for approx 20 – 25 minutes. Or until the bake doesn’t ‘wobble’ when you agitate the tin.Then leave to cool. 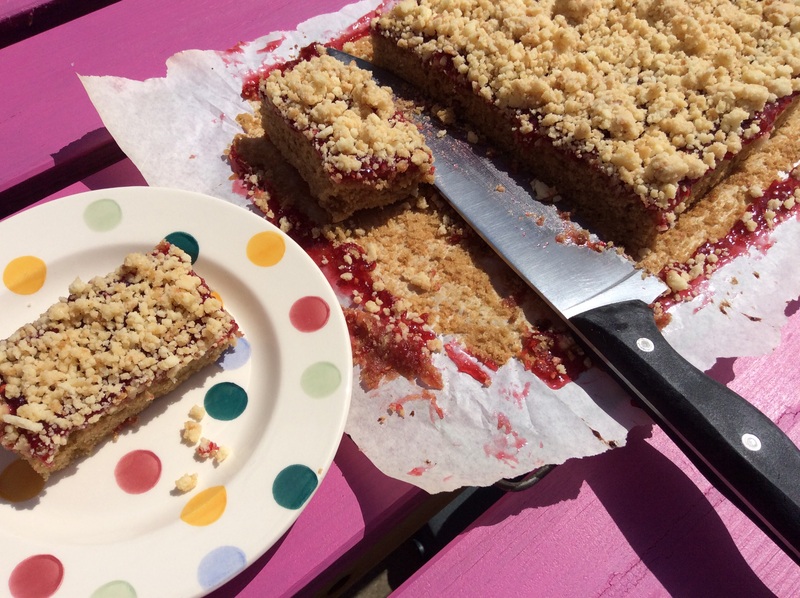 Once cool enough to spread the jam – the surface needs to be set, otherwise you will not be able to spread the jam successfully – warm the jam in the microwave and spread evenly over the surface of the Cakie and then sprinkle on the gluten free crumble. Remove from the tin, peel down the sides and slice as you need. You should get around 12 slices. It does depend on how generous you are feeling.